Fresh & exciting new "Two Tone" line now available. Healthcare Anti-Microbial vinyl upholstery program perfectly suited for medical waiting rooms, reception areas, lobbies & public spaces. 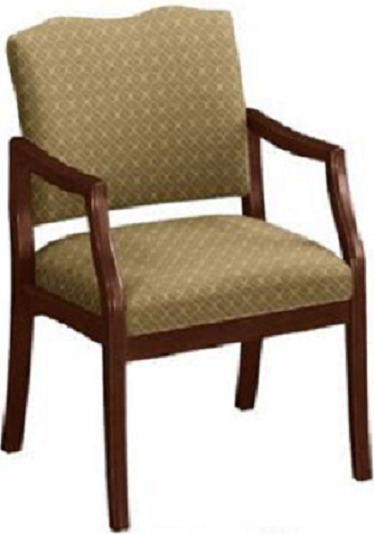 Adorn the seats in solid vinyl and compliment the backs in beautiful patterns of either contrasting vinyl or fabric LEGEND: V/V=Healthcare vinyl solid color seat and backs in contrasting patterned vinyl, V/F=Healthcare vinyl solid color seat and backs in patterned fabric. *MADE IN THE USA. USUALLY LEAVES CONNECTICUT FACTORY IN 3 WEEKS. A much welcomed updated design in this traditional guest side chair. Solid construction at an affordable price makes this the perfect purchase for your waiting room reception areas. WARRANTY: Lifetime Limited. UPS ABLE; shipping included.